Boston June 14 1796 to Pembroke, Massachusetts, privately carried letter (3 pages).Â Letter is docketedÂ "---- Cushing, Letter from Boston June 14th 1796". 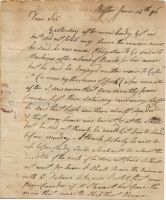 Note: Other letters of the Benjamin Cushing correspondence are preserved in the Winterthur Library, The Joseph Downs Collection of Manuscripts and Printed Ephemera, Henry Francis Du Pont Winterthur Museum, Winterthur, DE 19735. Dear Sir, Yesterday, after noon, (the ship) Candy got in but did not fetch my lime, the reason was he said he was under obligation to go down to Machias (Maine) after a Load of Boards for his owner but had said he engaged another man to go for it (a man by the name of Cook), few minutes after I saw a man that came directly from Camden left there Saturday morning last. He said that Cook was there almost loaded & that my lime was burnt at the shore but he said he did not think he would be quite loaded before Monday - I think probably he will be up before Candy sails which will be about the middle of the week if he does not come I shall not wait for him. I shall leave the business with B. Delano . . ."
Nathaniel Cushing (1762-1827) ran an iron works, making anchors in partricular, in Pembroke, Plymouth County, Massachusetts. For a time, he also had a store, but he closed that business to concentrate on the iron works. Later he was involved in the Pembroke Woolen and Cotton Manufactury. Nathaniel had brothers named Issac (a merchant in Spain), Charles and Benjamin (the last born in 1774, and who was a ship captain), and sisters Mehitable and Lucy (married to a Mr. Estabrook). The letter mentions burning lime - the process called calcination, which converts lime to the highly caustic material called quicklime (calcium oxide) which is used in producing iron. That is exactly the business that Cushing was in - manufacturing iron ship anchors.